This is the first bit of the story I have been working on to entertain you while I help with crafts at Vacation Bible School at a friend’s church. I’ve had fun writing it so far, and am now up do day seven of his camp experience. I have survived the first day of this thing they call “summer camp”. I’m at a loss as to why anyone would refer to this as fun. Below is a list of things which already irritate me about this ‘experience’. It may take a bit of investigation but preliminary findings suggest that the entire camp staff it is on crack or some other amphetamine. Normal people are just not that excited about the prospect of basket weaving and braided friendship bracelets. Day two of summer camp has been… Endured. I now have a black eye from a softball, a bruised shin from a field hockey stick, and perpetually running sinuses from being around my one and only identified allergen – pine trees. I have found no concrete evidence in the theory that the camp staff is on an amphetamine. Although I begin to suspect that their coffee is laced with it. I must obtain a sample for testing. The third day of summer camp is now behind me. I’m seriously considering a means of escape. I attempted to walk the parameter today, but was detoured three times by camp staffers. It would seem that I’m not the first camper to consider this strategy. I hope that the food improves. Thankfully my mother provided a generous stipend for purchasing a camp T-shirt and bike rentals. If the camp kitchen continues with this inadequate fare I may end up spending the entirety of it on apples and bags of nuts from the snack shack. Now that I think about it, perhaps this is their intention. Continuing on the subject of the kitchen, I regret to have to say I have been unable to procure a sample of the coffee. This may take more work than I’d previously thought. 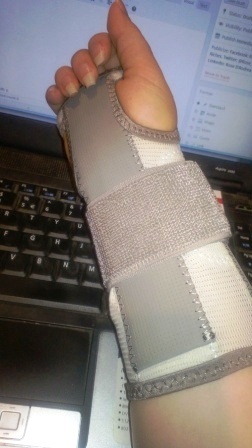 On another note, I am now able to go without my wrist brace for small amounts of time. It still doesn’t want to do much, but typing almost seems therapeutic. Who am I to stand in the way of ‘physical therapy’? 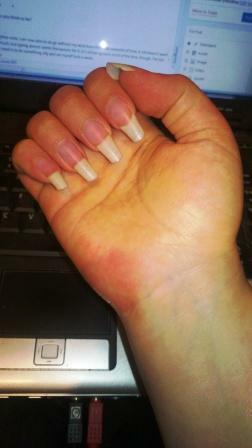 When did these nails get so Long?!! I’m not too sure how adventurous or interesting you will find it. I turned on my computer’s speech-to-text program this afternoon. Lonnie found me a mic that hangs from my ear. I went back through the tutorial, and ventured forth into a grand new world of verbal freedom. Or so I thought. Nearly every sentence needs edited in at least two places. The dratted program doesn’t automatically capitalize the beginning of a sentence if it has quotation marks first. Half the long words (6 or more letters) get broken into smaller ones that sound sort of like my intended choice. I am being told that in a week or two it should be zeroed in for my voice and speech pattern, but that kind of defeats the purpose. I turned the program on so that I could still work on these projects while I have an incapacitated hand. By the time the speech-to-text is finally working right, the wrist should be healed, and I won’t need it anymore. Yet another lesson in patience. I should learn it one of these days. Maybe after that life won’t have so many obnoxious speed bumps. Because, you guessed it, I hate waiting. On a lighter note, my husband discovered several Steam Punk magazines that are open to submissions of flash fiction. So, today (right after he told me) I sat down and told the computer a story. Then had to edit the snot out of it because it was totally messed up. I have a very nice post London Blitz what-if scenario flash story. Six hundred and fifty words (last time I checked). I think I’ll get the submission details and fire it off as soon as possible. That way I won’t have time to play my own what-if game and psych myself out of sending it. I got a little ways into a zombie flash before my honey set a plate of lasagna in front of me. Hopefully that one will be finished some time tomorrow. If all goes reasonably well I’m considering making it a point to write a Steam Punk flash fiction piece a week. If nothing else it will give me more practice at finishing a writing project. Heh. *Looks guiltily around the room* Not that I have trouble with that or anything. Have you ever sent something in to a magazine (e-zines included)? Did they publish it? What happened? What kind of results do you get out of any speech-to-text programs you use? 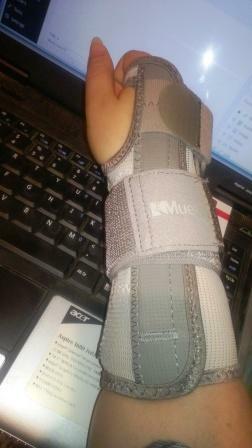 The New, Super Duper Wrist Brace! At least it’s done in nice shades of grey. Less likely to clash with my very expensive, highly thought out wardrobe. (You’re catching the sarcasm there, right?). On the plus side, maybe this ouch will heal a little faster. On the down side it really is next to impossible to use on a keyboard. I know, I know. Rest the wrist. But darn it! I have so many words and ideas that need to be captured! Well, I am just plain tuckered out. So I’m going to head for my pillow and pray I don’t beat myself to death in my sleep with a store-bought version of a velcro-on cast. I think tomorrow will be the left-handed hair brushing lesson. Not to mention that my nails are getting ridiculously long. Life is going to be a non-stop adventure for the foreseeable future! Yeah, I’m not a very good patient. There are things that need doing and I have never liked asking for help. So all day long I have been irritating my wrist in little ways. Here and there making it work more than it should (like adding just over 500 words to my secret WIP). Now I am slowing down at the end of the day, and it is telling me all about how stupid it was to be stubborn. Maybe I’ll stick my hand in a sock tomorrow. Can’t grab anything if you don’t have a thumb, and it’ll be guaranteed to slip through my grip. No more typing. On to the educational videos. Really, more wives should look into writing poetry. Those momentary feelings of loss and anger when he needs his guy time are great emotions to fuel that new poem. This song gets really cool when you realize that there were only 2 instruments used in the making of the music. All the ‘percussion’ is from beat box sound effects by the cellist and maybe one of the other guys. 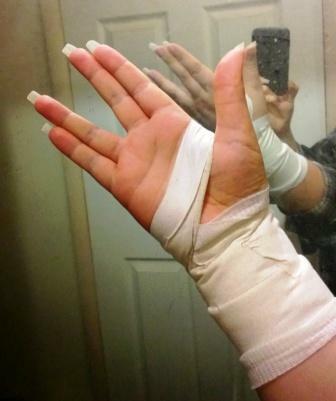 Hopefully this wrist will heal quickly. While I can type, it hurts when I reach for things like the shift and enter keys. I have to move my entire arm to get to the backspace. grrr. On the plus side this wrap he put on me (to keep my hand from moving wrong and irritating the strain) is too large for my dish glove to fit over. Way to find the silver lining, huh? Although I have yet to add to my ‘secret book’s’ word count, I have managed to put a few new thoughts into the plans for another book. So today has not been wasted. I think (after icing this thing down from this typing session) I’ll see about adding a couple hundred words to the ‘secret book project’. This really is too much fun: Having a secret. It’s kind of exhilarating knowing that I’m the only person who knows what this little project is about. And maybe I’ll find a little acetaminophen, too.